With this bundle you'll get 100 capsules, compatible with OriginalLine Nespresso® machines. Chose one of our flavors mix and discover all Italian Coffee flavors for coffee lovers. A blend of only Arabica beans for a classy, smooth espresso! Directions To prepare your cup proceed normally (check the manual that came with your machine). 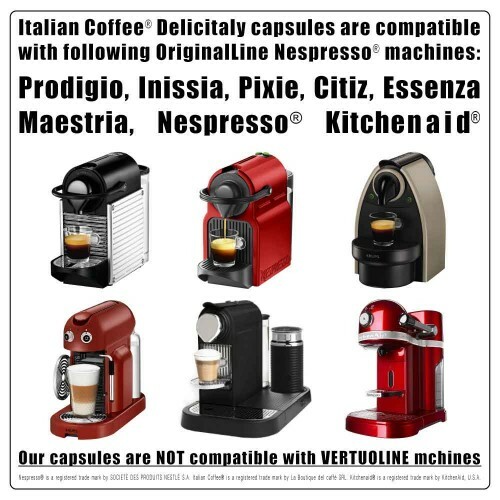 Legal Note Italian Coffee® capsules come in a 10-capsules sealed box and are patented and certified to be compatible with OriginalLine Nespresso® machines Prodigio, Inissia, Pixie, Citiz, Essenza, Maestria and Kitchenaid®. Nespresso® is a registered trade mark by SOCIETÈ DES PRODUITS NESTLÈ S.A. Italian Coffee® is a registered trade mark by La Boutique del caffè SRL. Kitchenaid® is a registered trade mark by KitchenAid, U.S.A. There is no affiliation between Nespresso®, Kitchenaid® and their affiliates and IMPORT39 LLC and any of its affiliates. Ingredients Ground and roasted coffee blend, packed in a modified atmosphere in single-serve capsules. The product naturally contains caffeine. Indications Store in dry place at room temperature. FREE SHIPPING for coffee orders over $24.99! FREE SHIPPING for other orders over $74.99!